Top the strawberries and only wash the ones which are dirty. 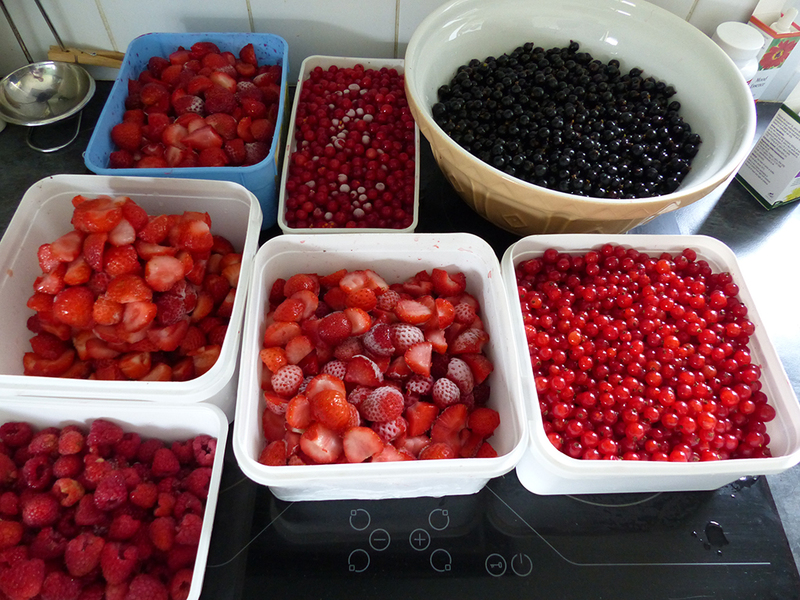 Mash the berries well and mix with the sugar and 2ltr of the water. Leave for 36 hours, then strain the liquid into a demijohn. Add one litre of water to the strawberry pulp and strain again into the demijohn. Add the citric acid, tannin (or tea), yeast and yeast nutrient and top up to around 5cm under the rim. Insert a bored bung and stir thoroughly by holding your thumb on the hole. Fill an airlock with water and insert into the hole of the bung. Leave to ferment in a warm place (but no warmer than 28C) for a few weeks. You should be hearing the gentle bubbling of the fermentation. When the bubbling stops, fermentation is complete and you can now finish the wine. Syphon off the wine into a clean container (this can be another demijohn or just something to hold the liquid). But make sure you have the wine in a demijohn again when stopping the fermentation. To stop the fermentation add 1 crushed campden tablet and 1 tsp wine stabilizer (dissolved in a little bit of water). Shake well, like you did before and leave to clear in a dark place. You can use wine finings to speed up the clearing, but these are often not vegetarian, I just leave the demijohn for a couple of months. However, you can bottle the wine after a month or so. Strawberry is drinkable after just one or two months. It is great on warm summer days or with a barbecue. Strawberry wine is one of my favourite homemade wines, I drink this one for summer and the elderberry wine in winter time. You can buy equipment from any our shop in Stirling, but we also sell the chemicals via our online shop. use 1.5kg currants and 1.75kg sugar and add boiling water to the sugar and fruit and add 1tsp pectolase. Leave for 5 days and follow same instructions as for strawberry wine.